Decision of getting married and settling down in life is the biggest steps to be taken by a person. You make choice of your life partner with utmost clarity that you wish to spend your whole life with that person. In Hindu marriages people vow to spend even seven lives with each other. So the marriages in India are more about a knot tied forever, before and after life. Hence the choice of your life partner does matters a lot. Despite this, relationships are breakdown. Infidelity is becoming the number one cause of divorces in India. Perhaps it is the most devastating cause of all. Even though you forgive your partner on issues of infidelity however it completely breaks your trust. It is easier to forgive but the forgetting the truth that you have been cheated is impossible to delude. It erodes your trust from your partner. Ultimately a relationship dies rotten. A number of people suspect the changed behaviour of their partner. However, they lack proof to confront them. They don’t know how to approach them, especially when they are convinced that the ultimate resolution will be divorce. Hence, in such circumstances, you need support of professionals in investigation and legal matters. Hiring a privateinvestigator for surveillance can prove out to be helpful approach in number of ways. With the help of a private detective you can be sure how to proceed. What are those initial steps you have to take if you about tracking and carrying a surveillance. The surveillance or shadowing is one of the most dependable ways to know the truth. It revels what a person claims to be and what is the actual truth. Moreover, it is the oldest methods used to find out the truth by private detectives. This method will give you information of your partner in real time manner. If you are doubtful about unfaithfulness by your partner surveillance by a private investigator will reveal the truth. The active surveillance also helps you to achieve solid proof that you can even present in front of court. When a private investigator follows your partner, they will document each activity with audio and video proofs of the activity. It is the best utilized service to know the whether someone is part of infidelity or not. The private investigators also have rich legal experience as well. So it makes them your best reliable source to go for legal advice in matter of divorce. Surveillance by a private detective agency can put your mental quandary to end. They will help you gather the evidence against the betrayal. 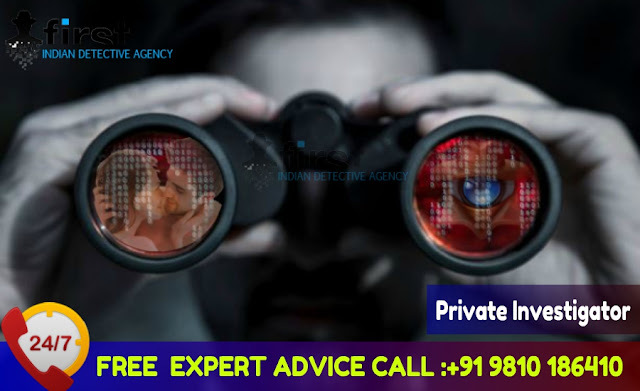 FIDA- First Indian Detective Agency in Delhi have expertise in infidelity investigation matters. The individual hiring a PI can relax knowing that someone is devoting their professional time and energy into their concern. With Headquarter in New Delhi, and office spread across all the major cities of India, our approach of investigation is countrywide. Reach us for support now.